The Digital library plays an important role in promoting the use of information. 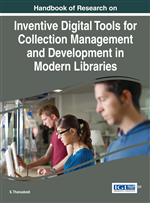 Digital libraries give solutions to main challenges to traditional libraries such as storage. This paper discusses the concept of digital library and how it helps in conserving manuscripts and what type of equipments or software are required in this work. We want digital information in every field so that every library should be a digital library. It highlights the Necessity, Challenges and issues in creating digital library, there are certain issues which should be taken care like copyright and Intellectual Property Right. This article also explores successful digital library project set up in India and what is the future of digital library in Indian scenario. The “Digital” word means that all knowledge is divided into two digits the binary string of 0s and 1s that make up the genetic code of data. Libraries store materials in electronic format and access the same format. The concept of digital libraries has appeared ‘libraries without wall’ (Dabas, 2008). Virtual Library: A Virtual Library is a collection of resources available on one or more computer systems, where a single interface or entry point to the collections is provided. Traditional Library: Traditional Libraries gives emphasis on storage and preservation of physical items, particularly books and periodicals those in which librarian were a custodian of the library. Information is physically assembled in one place; users must travel to the library to learn what is there and make use of it. Digital Preservation: Digital Preservation is the set of procedures and activities that ensures continued approach to information, existing records, scientific and cultural heritage which are available in digital formats. Information Technology: Information Technology (IT) is the application of computers and telecommunications equipment to store, retrieve, transmit and manipulate data. Scanning: The process of translating photographs into a digital form that can be recognized by a computer. Copyright: The legal right granted to a copyright holder for the exclusive sale, distribution or reproduction of a creative work. It is a form of intellectual property that prevents others from using a creative work without consent of the owner. Digital Library: It is a collection of documents which is organized in electronic form, available on the Internet or on CD-ROM disks. Depending on the specific library, a user may be able to access magazine articles, books, papers, images, sound files, and videos. OPAC: (On-line public access catalogue): OPAC is an online database of materials held by a library or group of libraries. Users search a library catalog principally to locate books and other material available at a library.